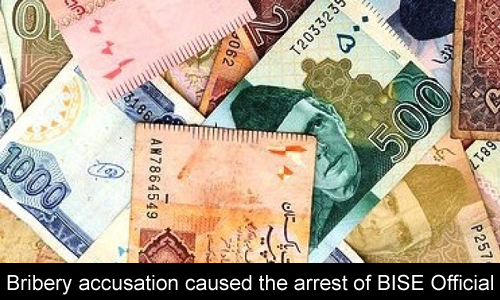 An employee of the board of intermediate and secondary education Lahore was found taking bribe for certain acts and was arrested by the Anti-Corruption Establishment on Friday. According to the report, Ayyaz Khan who is the assistant in Bise Lahore was caught taking bribe from the people on assuring them an admission in the Medical colleges on the Punjab Governor’s quota. They say that the director of ACE Lahore region, Sheikh Khalid received a complaint from Muhammad Farooq who said that the accused demanded 0.7 million from him for arranging the admission in the medical college. He then managed an inquiry and found the accused guilty of it and as the result of him being proved guilty, he was arrested and a lawsuit was filed against him by ACE Lahore. The process is continued and further investigations are carried away these days. This is an alarming situation for the government and the other law making agencies that if these kind of things continue to happen, there will be no merit and the profession of medicine will be occupied by the non professional and non capable doctors.